Physicians Formula Eye Booster Instant Doll Lash Extension Kit - $19.99 - for DIY lash extensions that make lashes look extra long, lifted and defined. Extra-long extensions provide a bold, doll-like look that visually enlarges and widens eyes for a sophisticated day or dramatic evening look with 24 hour wear. 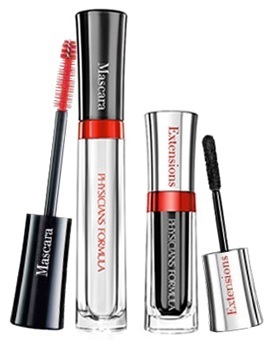 It's a 3 step process - 1) sweep the Lash Boosting Mascara to prep for extensions and layer on lash boosting ingredients; 2) brush on extensions while mascara is still wet to instantly lengthen and define lashes; 3) reapply Lash Boosting Mascara to seal and set extensions. It's easy enough to do but man it makes a mess - be prepared to have bits of fibres all over your face - you can use an old powder brush and they brush off easily enough! I do like the final effect but owing to my general laziness and lack of time for messing around with my face this would only be a very special occasion product for me!